Colonel Sanders was real. Betty Crocker was not. And, despite rumors to the contrary, Chef "Boy-Ar-Dee" was more Colonel than Betty - although that wasn't the correct spelling of his name. While we may think of him as the man on the can, Ettore "Hector" Boiardi was, in fact, one of the top culinary talents in America who even cooked for a president. From Italian immigrant to selling his company for millions, Boiardi's story is the very embodiment of the American dream. Born 119 years ago this month (October 22nd, 1897) in the northern Italian city of Piacenza (part of Italy's famous "food valley"), legend has it that cooking was so ingrained in Boiardi that he used a wire whisk as a rattle. By 11, according to his great-niece Ann Boiardi's 2011 book, he was already a chef's apprentice at a restaurant called "La Croce Bianca," where he mostly peeled potatoes and took out the garbage. He eventually took jobs in Paris and London, learning various restaurant skills to complement his Italian upbringing. But his goal was always to sail across the Atlantic and join his brother Paul in America. Paul Boiardi had moved to America when Hector was a small boy and had quickly found a job waiting tables in New York's Parisian Room at the famous Plaza Hotel. Soon, he moved up to the ranks of maître d', becoming one of the most well-known hosts in the city. In 1914, Hector Boiardi made the trip to America on the French ship La Lorraine, landing at Ellis Island. With his brother's help, he got a job in the kitchen at the Plaza. Fairly quickly, it became clear that the young Boiardi he was a prodigy. Cooking up recipes from his hometown, he so impressed customers that he was hired away to be the head chef at Barbetta on 46th Street (where it is still located to this day). He also garnered a summer job cooking at the historic and ritzy Greenbrier Resort in White Sulphur Springs, West Virginia (for 30 years, it was also the site of an underground bunker for Congress in the case of nuclear war). While in this job, he took on the immense responsibility of catering the 1915 wedding reception of President Woodrow Wilson to Edith Bolling Galt. So impressed with Boiardi's cooking, Wilson chose him to supervise the homecoming meal of 2,000 returning World War I soldiers in late 1918. Soon after, he was offered a job he couldn't turn down - to be head of the kitchen at Cleveland's famed and very popular Hotel Winton. By the age of 22, Hector Boiardi was one of America's most famous chefs - essentially Bobby Flay meets James Beard if they had barely finished going through puberty when they became big names. Looking to run his own business instead of working for others, his new wife Helen helped Hector open a restaurant in Cleveland, Giardino d' Italia - meaning "The Garden of Italy." At this time, Italian restaurants were just becoming immensely popular on the east and west coasts (thanks in large part to the influx of immigrants to these areas of the country) but it hadn't quite hit middle America yet. With Boiardi serving food from his northern Italian home of Piacenza to a population that wasn't already inundated with Italian food, his restaurant was perhaps the one of the most unique (and popular) in the city. Lines wrapped around the block and customers begged to know the secrets of his signature dish - cooked-to-order spaghetti with homemade sauce and cheese. Not only that, patrons were asking to take home his sauce to use at their own family dinners. So, using milk bottles, he packaged up the sauce and sent them off. However, demand for his sauce became too great and soon Boiardi realized that perhaps it was this "take-home" industry that was his future. At the persuasion of a couple of restaurant regulars, including a couple who owned a local grocery store chain, Boiardi built a small canning and processing plant in Cleveland. Joined by Paul and his other brother Mario from Italy, Hector launched the Chef Boiardi Food Company in 1928. The company specialized in three flavors of sauces: traditional, mushroom, and spicy Naples-style. While business was going well, Boiardi encountered a minor issue: salesmen and customers couldn't really pronounce his name. So, he changed the product's name to the phonetic Chef "Boy-Ar-Dee." Anne Boiardi would later say that her great-uncle was "proud of his own family name but sacrifices were necessary for progress." By 1936, the company had outgrown the Cleveland plant and moved to a large swath of land in Milton, Pennsylvania where they could grow their own tomatoes. In Milton, the company exploded. 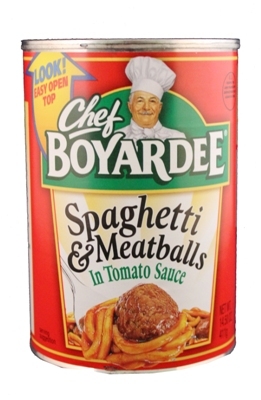 Their first product beyond simple sauce was prepackaged spaghetti dinners in clear cellophane covered containers that included a canister of grated parmesan cheese, a box of spaghetti and a large jar of spaghetti sauce. As Anna Boiardi told NPR in 2011, they were the largest importers of Parmesan cheese from Italy. Smashing 20,000 tons of tomatoes a season, the Milton factory produced upwards of 250,000 cans of sauce a day. Using brother Peter's Plaza Hotel connections, Chef "Boy-Ar-Dee" meals ended up on the shelves of A & P grocery stores across the country, by far the largest food retailer in America at the time. As Anna Boiardi writes in her book, "I think it is fair to say that those three men (the Boiardi brothers), with no formal education and very little money, can be credited with bringing Italian food to America." When World War II erupted in Europe, the food company was put to work making Army rations. This forced them to scale up and have the factory operate 24 hours a day. By the time the war ended, the company employed five thousand people and production far exceeded what they were doing in the 1930s. This was too much for Boiardi and his brothers to handle. They came in agreement to sell the company and factory to American Home Foods for nearly $6 million. American Home Foods was eventually acquired by the conglomerate ConAgra Foods, which still owns the Chef Boy-Ar-Dee brand today. Hector Boiardi remained on as a consultant and the face of canned pasta until 1978. He died at the age of 87 in 1985. As for the products that Hector Boiardi left as his legacy, Anna Boiardi admits that they may not be the same as when her great-uncle made them but it is an alternative for those who just don't have the time to cook. 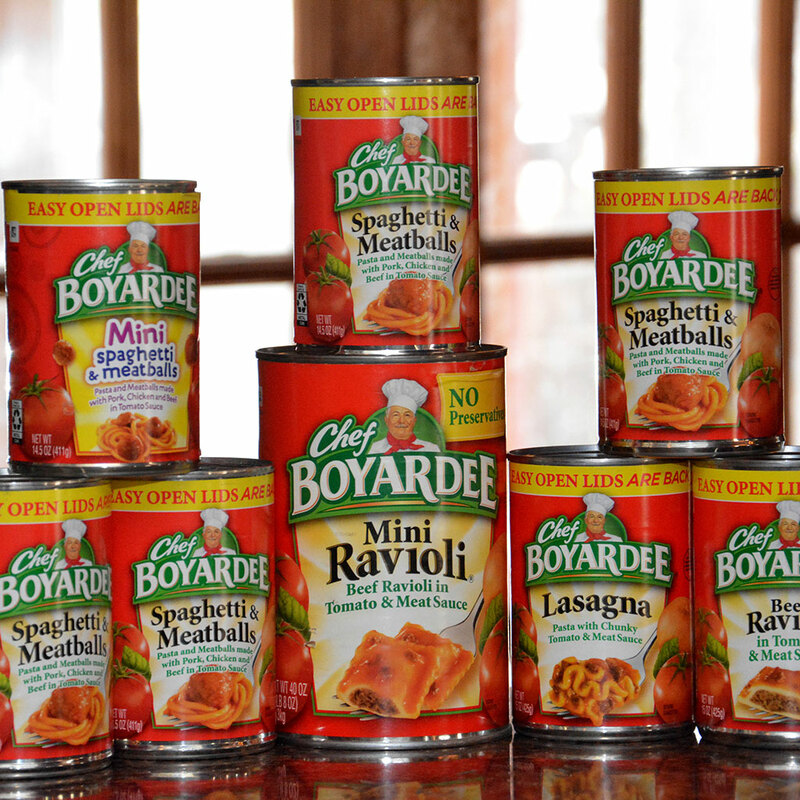 "There are people that are working, and their kids have to come home and make something for themselves," Boiardi told NPR, "even when I was growing up — and my mom is a fabulous cook — she would open up a can of Chef Boyardee for us on certain nights when there just wasn't enough time."